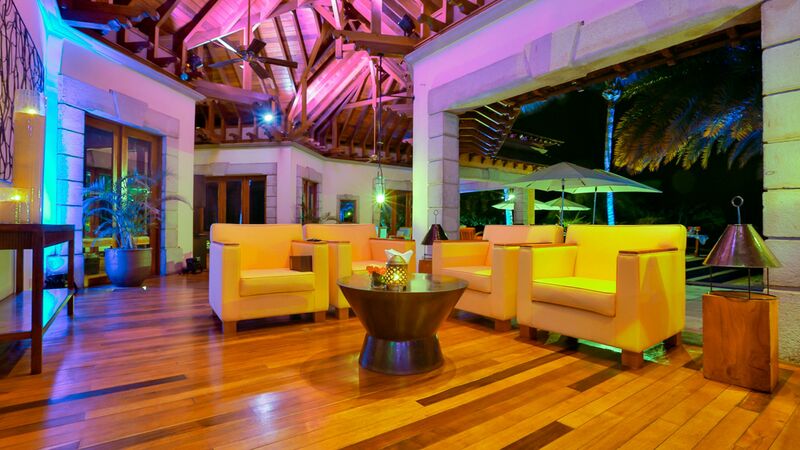 Maradiva Villas Resort and Spa offers everything you would expect from a leading hotel of the world. 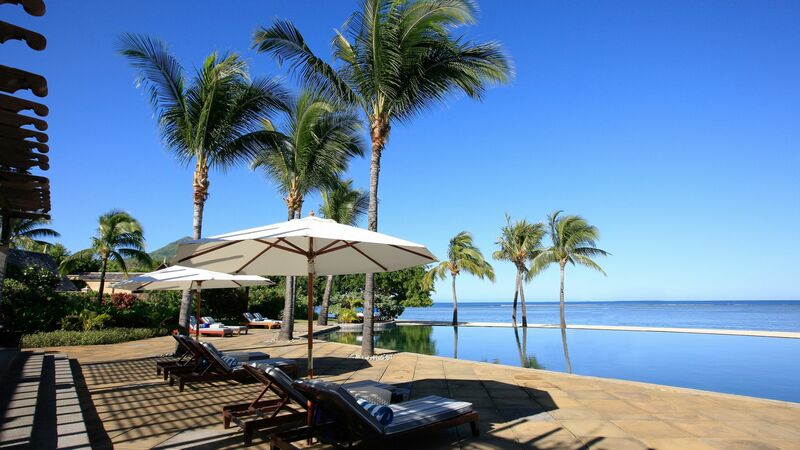 Its 65 villas are set in 27 acres of beautiful gardens right beside Tamarin Bay on the west coast of Mauritius – an area renowned for its glorious Instagram-worthy sunsets. 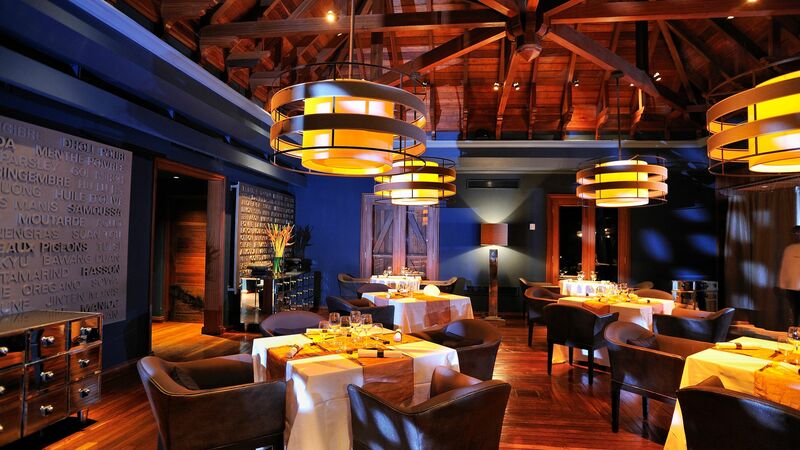 Here you can enjoy a buffet breakfast, an à la carte lunch and a set dinner menu. 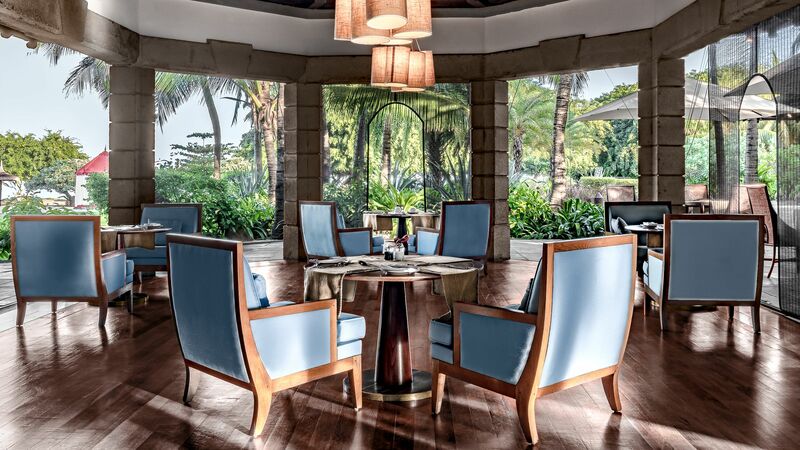 Choose from Mediterranean, Mauritian and international dishes in a colonial inspired setting. This restaurant has a Smart Casual dress code. No shorts or sleeveless shirts are permitted. This modern Indian restaurant serves delicious à la carte dinners with authentic flavours and creamy curries on offer. The restaurant has a Smart Casual dress code. 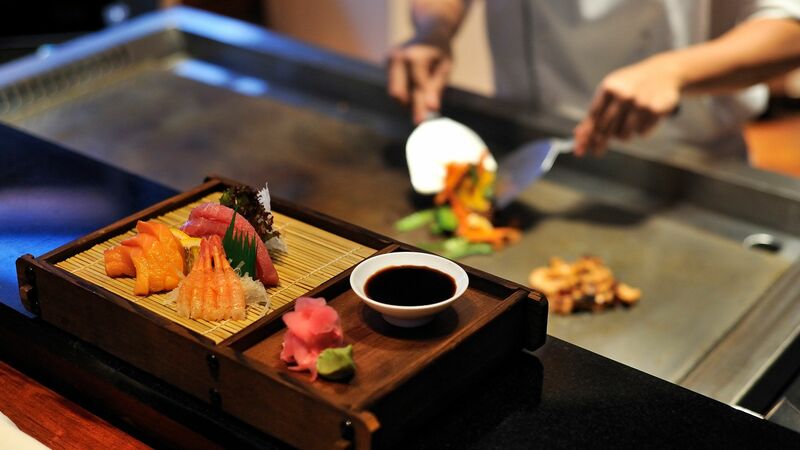 This restaurant serves traditional Japanese dishes on the Teppan counter, in two sittings. In the contemporary décor of this lounge bar you can enjoy light meals along with a comprehensive range of international wines and spirits. The Maradiva Villas Resort and Spa is set right on a white sandy beach where you can spend days soaking up the sun on loungers. Maradiva Villas Resort and Spa offers every opportunity to take a refreshing dip. Not only does each villa have its own private pool, the resort has a main swimming pool and a children’s pool at the mini club. 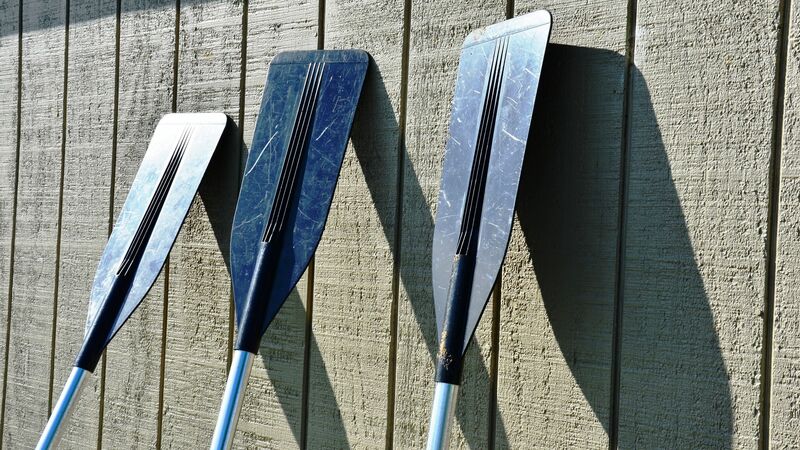 Open to children between 4 and 12 years’ old, the resort’s mini club offers a full programme of activities to keep your youngsters entertained, alongside its playground and paddling pool. The Maradiva Spa is the place to indulge in some self-care during your stay. It offers a range of signature face and body treatments, alongside a sauna, steam room and laconium (dry heat treatment room). There is also a relaxation pool with a whirlpool, relaxation area, a hair and make up parlour and a yoga pavilion. 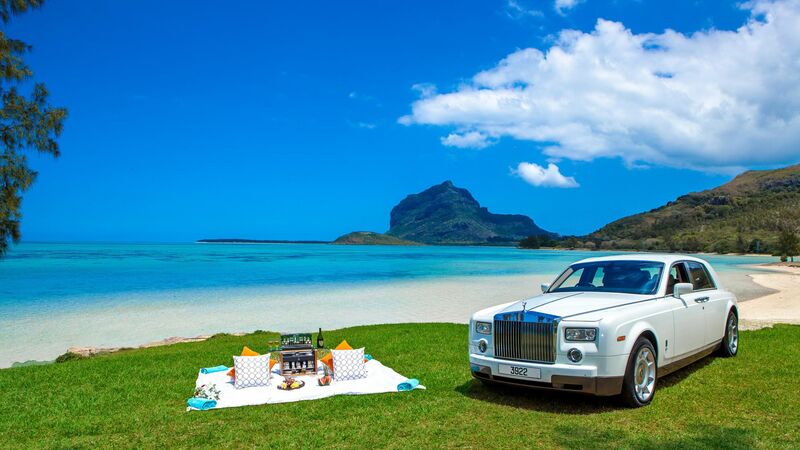 Get away from the coast and see some of the beautiful interior landscapes with a sightseeing tour in a Rolls Royce, which is packed with a gourmet picnic for your enjoyment. Take some cookery classes and learn some new skills to try out when you return home. Guests can choose from Catamaran and sunset cruises, scuba diving, swimming with dolphins, deep sea fishing and lots more. 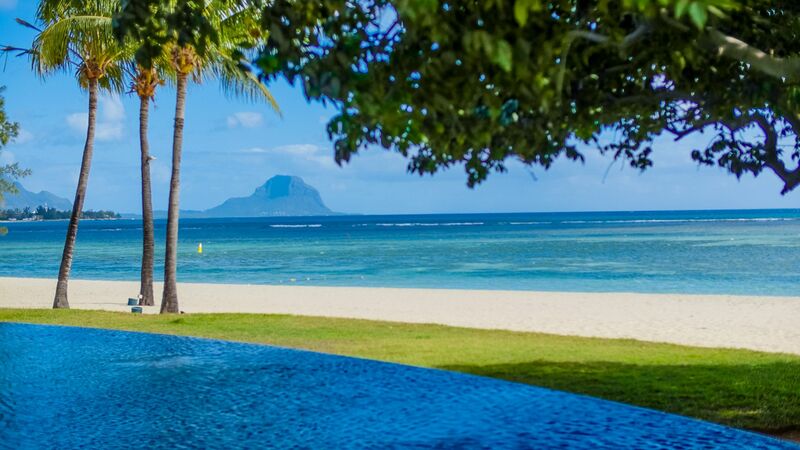 Just a 45 minutes’ drive from the capital city, Port Louis, the village of Flic en Flac sits between the sugarcane fields of Mauritius’ west coast and a beach boasting powder fine sand that’s as white as the fruit of the coconut trees that edge it. The palm trees provide shade and breeze breakers for a necklace of hotel pearls and restaurants where the sunset is as delectable as the food they serve. The water attracts kayakers, snorkelers and divers seeking an underwater view of 19th century shipwrecks, volcanic rock formations and underwater caverns. If you prefer to stay on dry land check out the Tamarina golf club at Flic en Flac’s southern end. This is an 18 hole championship course with views that are anything but below par, overlooking the sweeping sands of Tamarin Bay and the sharp peaks of Rempart Mountain. 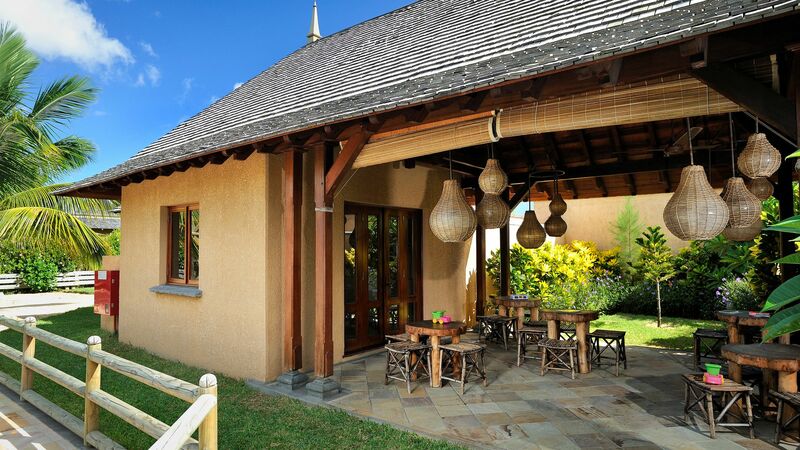 Maradiva Villas Resort and Spa is 1 hour from Mauritius International airport. 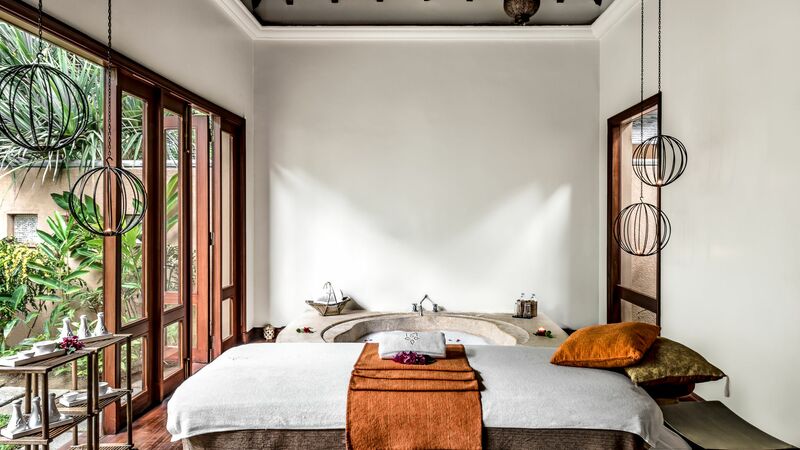 Surrounded by lush tropical gardens, the Luxury Suite Pool Villas feature a bedroom with a walk-in wardrobe, bathroom with a bath and a separate rain shower as well an open air outdoor shower. Outside, there is a large private terrace complete with outdoor furniture and your very own pool as well as an al fresco dining area. Overlooking the simmering blue sea with a direct access to the beach, the Beachfront Luxury Suite Pool Villas feature a bedroom with a walk-in wardrobe, bathroom with a bath and a separate rain shower as well an open air outdoor shower. Outside, there is a large private terrace complete with outdoor furniture and your very own pool as well as an al fresco dining area. Overlooking the simmering blue sea with a direct access to the beach, the Exclusive Suite Pool Villas feature a bedroom with a walk-in wardrobe, spacious living room, bathroom with a bath and a separate rain shower as well an open air outdoor shower. Outside, there is a large private terrace complete with outdoor furniture and an al fresco dining area as well as an infinity-edge pool. The luxury Presidential Villas are located on the berachfront, featuring two bedrooms, each with an en-suite bathrooms with a circular bath and a separate rain shower, walk-in wardrobe and secluded open-air outdoor shower. The villas also feature a spacious living room and an al fresco dining area overlooking a private heated infinity swimming pool. Save up to 10% on the hotel price for holidays booked at least 60 days in advance between 03 January - 31 October 2019. Stay 6 nights or more and receive a 35% discount on the hotel price for holidays between 03 January - 31 October 2019. “ One of the best places we've ever stayed at! “ Thank you Maradiva, What a perfect choice for our Wedding! This review is based on our stay in March 2019. This is a long review as a few words simply isn't enough! After arriving at the hotel (around 50minutes from Airport) we were greeted by very friendly faces and had our luggage taken from transfer car to our Villa. Seeing we were incredibly hot (it was 35*C! ), they offered us a cold refreshment and a cold towel to cool off. Once formalities were completed (signing in etc), we were taken on a tour of the site where each area was explained to us by the driver of the cart. We were taken to our villa and left to explore. WOW! What a place. The villas are Spacious, Clean, Welcoming and the Air-Con is a relief after a hot day! We were in a villa not far from the beach, so that was a fantastic sight to wake up to and go out to each morning. Nothing is an inconvenience to the staff at this Resort. They are all Friendly, Helpful and give a service we have never experienced. 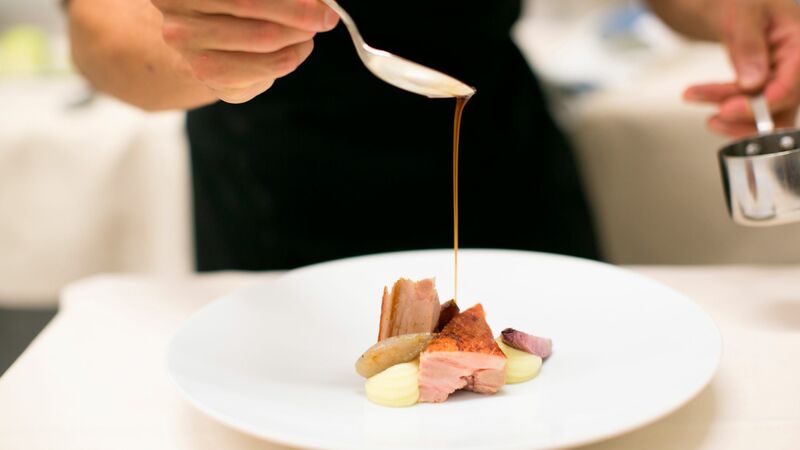 (We were left sorely disappointed when we ate at Ask Italian in the UK the next day!). We were greeted by name and with a friendly smile wherever we went; Restaurants, Reception, Spa, Gym, even when walking around the grounds! At Dinner, we tended to be waited on by the same few staff (sorry I'm awful with names), who always knew what we would want to drink before we had to ask. The location is set in a quiet part of the island, possibly the furthest west you can get, where you won't be disturbed as it is at the end of the coastal road (one more hotel - Sands? - after us before mountains and jungle like area) I think I counted 67 villas in total (on map), and you wouldn't know it. Very rarely we saw other guests unless it was breakfast or dinner, and even then because of the choices available you wouldn't see everyone. By choices, you can eat at the main restaurant, a Tepenyaki or an Indian Restaurant. The weather is spot on. Very Hot, 99% Sunny, with unobstructed views of the ocean and sky to the west. Perfect for Sunsets! When it does rain, it is brief and tended to be over night. It gets cloudy and nasty to the south over Tamarin, but it doesn't really reach Flic en Flac area. The cleaners, gardeners and the hidden staff make sure the hotel is clean and spotless. I am unsure where recent reviews have seen, as the grounds are beautiful, green and full of life. The gardeners worked from Sunrise to Sunset to ensure everywhere looked pristine. If you're relaxing by the main pool, or on the beach, the staff will bring you treats such as cold fresh lemonade, or fruits to keep you going. All complimentary. We got married at this resort, and what a fantastic choice. We chose the Jetty as a location, as although our intention was to marry on the Beach, we saw it set up one day for a previous wedding (there were only two during our stay), and we loved it. I'll hopefully attach some pictures to this review. The wedding co-ordinator Annielle was very attentive, and listened to what we wanted. She ensured everything ran smoothly on the day. The chef who created our menu and adjusted to our needs was also very helpful and created the perfect dinner (and breakfast!!) *Of course, there were some negative points about Maradvia* The biggest issue I had with this Resort is that everywhere you read - Websites, Reviews, even on a placard in the villa - they state a dress code of "Smart Casual". This can be interpreted how you like, however, when I did ask the question via Facebook Messenger, I was told that it was "Long Sleeve and Trouser". I felt an absolute fool on the first night when I turned up absolutely baking hot, in a long sleeve shirt, with everyone else dressed down! Polo shirts, T shirts, shirts with cartoons on them etc. I could have brought more short sleeve tops with me to last the holiday, instead brought a load of long sleeve which went unworn. There was absolutely no enforcement of a dress code. Another negative is the fact that as guests, you are "Captive Audience" by which is that drinks and food costs 10X as much as it does out of resort. I can only go by GBP conversion to MUR (44rupee to ??1). A Glass of coke, 330ml in size costs 200 or 230 rupee - that's about ??5. For comparison, a can of the same size in the uk costs 25-50p. If you visit the SPAR superstore an hours walk away (or use the free cycles available) a 2ltr bottle of coca cola costs 56 rupee, just over ??1. Water, which comes in a glass 1ltr? botlte at dinner, costs either 200 or 230 rupee, again ? ?5 for water! Warm most of the time (but we asked for ice) and I'm sure it is simply tap water refilled in a Maradiva branded bottle Dinner/Lunch if not included costs a fortune too. Expected perhaps of a 5star resort with excellent service. If you are half board, your limited to your food options without paying a surcharge on top. This is not explained to you anywhere before booking!! You will feel absolute joy at a stocked Minibar in your villa. Cold beers, wine and soft drinks are available. BUT BE WARNED! it is NOT explained that these can be drunk for a surcharge of over 200rupee per item. We only found out by reading a hidden sheet of prices on the desk in room. We simply bought our own. Take plenty of money with you as it will run out fast if you don't leave the resort. Overall, our stay was excellent, and to be honest, the negatives above didn't affect our overall stay. A bit of a peeve, but that is all Maradiva, thanks for a wonderful place, a life of lasting memories. We hope to visit again one day in the future. Perhaps for a special anniversary! Review readers: I can't put everything here! if you've got any questions please message me and I'll get back to you! So much to say, but so little space to write it.